Published: May 27, 2015 08:00pm ET on LiveScience. Getting inked may have long-term consequences beyond just having to live with your ex-girlfriend's name on your bicep for decades. About 1 in 10 people who get tattoos experiences problems with the tattoo, including infection, itching, swelling and redness, according to a small study in the June issue of the journal Contact Dermatitis. Many people in the study had complications that lingered for years after the tattoo was inked, the researchers said. Leger began noticing that a surprising number of patients were coming into her clinic because of issues with their tattoos. She began to wonder how common these issues were, and after chatting with friends and colleagues, she realized they also had stories about tattoo-related complications. To understand how common these complications were, Leger and her colleagues randomly chose about 300 tattooed people in New York's Central Park and asked them whether they'd had any problems with their tattoos. About 10 percent of the people said they'd had some complications. For some, these complications were short-lived, such as bacterial infection right after the tattoo was inked, or temporary swelling and itching. But of those who had complaints, six in 10 suffered from chronic problems. And although many had suffered from unpleasant itching or swelling for years, few had bothered to get their problems checked by a doctor, the researchers found. Although tattoo artists and parlors are strictly regulated in order to limit infection and disease transmission risk, few people know what is in the tattoo ink itself. "Tattoo inks aren't very closely regulated in the United States," Leger told Live Science. Some studies in Europe suggest that black ink often contains carbon-based pigments, whereas red dyes may contain "azo-based hues," which contain nitrogen compounds. Some early research hints that these inks can cause different types of reactions, Leger said. The cause of tattoo problems isn't clear in all cases, though there are clues for some. "Some of the stories we got do definitely sound like tattoo allergy," Leger said. "They'll have a red tattoo, and then a few years later, they will get a new tattoo — and, all of a sudden, the new red and the old red tattoo become itchy and raised." Most people who get tattoos are already willing to face some risk, Leger said. 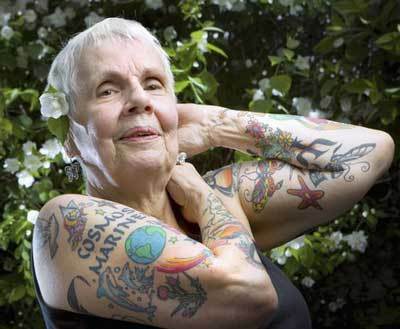 After all, everyone who gets a permanent body modification faces the risk that it will turn out ugly, fade in the sun or simply not accurately reflect their personality as they age. "I don't think anyone gets a tattoo because it's totally safe; I think people do it because it's culturally a little bit rebellious," Leger said. But beyond the well-known risks, people should also recognize the chance that there will be physical complications, Leger said. It's also important that people who experience these symptoms see a doctor, Leger said. Doctors may prescribe topical ointments for itchiness, or oral steroids for more serious flare-ups. In some cases, removing the tattoo may be the best option, Leger added. If people choose to have their tattoos removed, they should go to someone experienced in the removal process, Leger said. "There have been case reports of tattoo removal in certain kinds of ways that can cause anaphylactic reactions," Leger said, referring to the deadly allergic reaction that involves the closing of the throat and a dangerous drop in blood pressure.